Glassblowing lathes are found in almost every scientific glassblowing shop. The primary function of the lathe is to hold and rotate glass tubing, rod or glass apparatus during the glass fabrication process. Lathes are extremely useful to the scientific glassblower, providing a much wider range of glass manipulation, size and accuracy than can normally be achieved by hand. 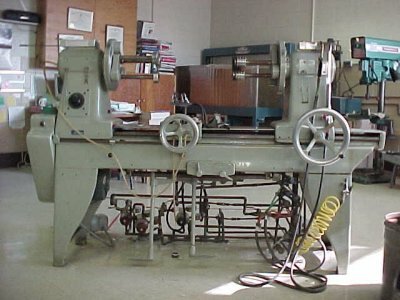 Glass lathes are available as bench or floor models. The head stock (left) is fixed, and usually houses the main controls (on/off, rotational speed). The tail stock (right) moves towards or away from the head stock by way of the larger wheel on the right. This movement is used to gather or take away glass during the fabrication process. The tail stock moves on rails (or ways) that maintain extremely accurate alignment with the head stock. 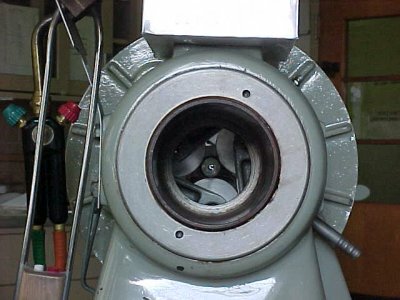 This is a view of the lathe spindle which is found in both the head and tail stock. The spindles rotate evenly with each other. 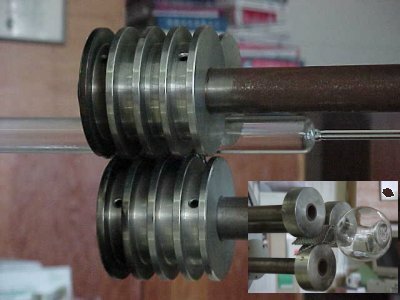 The spindle bore size is much larger than spindle bores found on metal or woodworking lathes. Glassblowing lathe capacity is partially determined by the size of the glass tubing able to pass through the spindle. This photo shows the clamping end of the chucks, which are attached to the spindles. These ends are referred to as "doughnuts". The small insert in the lower right corner shows a standard set of doughnuts holding a flask. The main photo shows an improved version which is longer in length has a series of grooves. The grooves are offset to allow them to fully close, permitting them to hold much smaller diameters of glass tubing. Working with a lathe may mean working on larger glass. This may translate into more heat generation and the need to remove it as well as possible outgassing by-products. 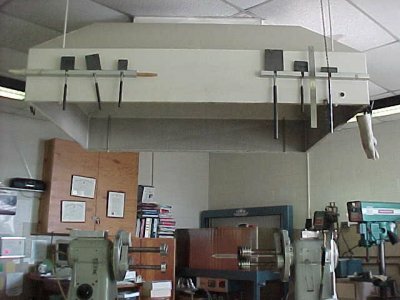 Canopy hoods aid in the removal of the heat and gases, and serve well as additional holding or staging places for the glassblower's tools as shown here.